Sous Vide. 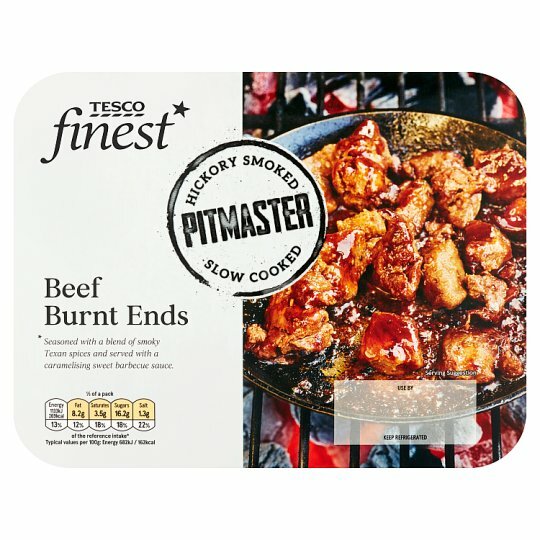 These diced beef chuck pieces has been sealed in an air tight bag and slowly cooked to lock in juices and give a succulent texture. INGREDIENTS: Smoked Beef Chuck (83%)[Beef, Sugar, Maize Starch, Spices, Pea Starch, Dextrose, Tomato Powder, Yeast Extract Powder, Garlic Powder, Smoked Salt, Chilli Flakes, Caramelised Sugar Powder, Chilli, Parsley, Cumin Powder, Salt, Oregano], Barbecue Sauce (16%)[Muscovado Sugar, Sugar, Tomato Flake, Water, Molasses, Spirit Vinegar, Concentrated Pineapple Juice, Tomato Purée, Corn Starch, Spices, Salt, Mustard Powder, Smoked Salt]. Keep refrigerated below 4°C. Once opened, use immediately. Instructions: For best results, oven cook. 200°C/Fan 180°C/Gas 6 35 mins Remove outer sleeve, remove top film and set sachet of sauce to one side. Remove the contents of the pouch, breaking apart the meat pieces into the foil tray provided and cover with foil. Place in the centre of pre-heated oven for 30 minutes. Remove from oven, discard foil and cooking juices, open sauce sachet and pour over the meat and mix well. Return to oven uncovered for a further 5 minutes. Defrost thoroughly for a minimum of 12 hours in a refrigerator.